Scott (Amos) Publications makes country stamp albums for just about all the countries of the World, and they feature one-sided illustrated pages containing all the major stamps for each country, as listed in the Scott Standard Postage Stamp Catalogs. Like the Scott U.S. National Album, the specialty page units, three-ring binders, and slip-cases are all sold separately. The newer pages are cut for both the new three-ring Scott binders and the older two-post ones, so it you have an old Scott specialty binder, you can use the newer Scott pages with it. Through this method, you can collect an entire country of your choosing. Or, you can get a blank Scott binder and pick the page groups of whatever area suits your interest. I will provide an eBay search link below, that you can use to shop for available Scott Specialty albums, page groups, and supplements. You have the choice of buying lots, both new and used, through eBay's online auctions or from fixed-price sellers. In some instances, you might even be able to pick up an affordable collection that comes in a recent Scott Specialty album. then all you would have to do is buy the supplement pages to bring the album up-to-date. If you're looking for a complete selection of brand new Scott binders, pages, and supplements, there are many stamp supply dealers, found on the internet, that carry the full line of Scott Album products. 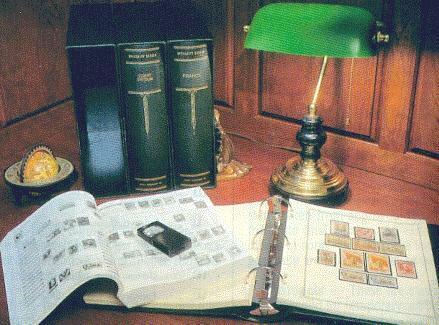 Palo Albums, Inc. was started in 1999 by a Worldwide stamp collector that desired elegant specialized albums for the countries he collected. These albums are in the luxury class, and most of them are arranged according to the Scott Catalog numbering system. Today, Palo offers albums for EVERY country of the World. Their deluxe albums come either with or without mounts, and some of the albums even have the stamp illustrations printed in COLOR! Click on the hot-link at the beginning of this paragraph to open a new browser window taking you to their website.